Shurlee Swain considers how historians might read the silences about domestic abuse in historical records, in the latest instalment of the 16 Days of Activism Against Gender Violence series. The recent shocking disclosures around the death of Queensland foster child Tiahleigh Palmer have generated yet another inquiry into foster care. It was a thoroughly predictable response, yet such calls to reform the system divert attention from any acknowledgment of the dangers women and children routinely face in the family home. These dangers transfer over, and are perhaps even amplified in, out-of-home care models that mimic the nuclear family. 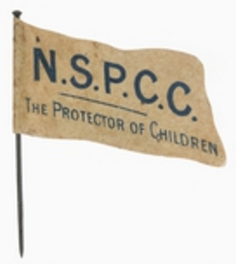 Fundraising badge for National Society for the Prevention of Cruelty to Children, circa 1918. Image via Trove. The focus on the systemic rather than the familial is not new. The earliest advocates of boarding-out in Australia cautioned against placing girls in homes with older male foster siblings, but they were rarely explicit about the dangers they were seeking to avoid. The periodic scandals that plagued the system made similar veiled references to the particular risks faced by girls, risks which intensified when adolescent girls were sent into service in private family homes. Yet there was rarely any attempt at elaboration. The silences surrounding gendered violence in welfare records make it easy to miss its endemic presence. It was when I was researching the history of the Victorian Society for the Prevention of Cruelty to Children that my eyes were opened to this reality. Amongst the Society’s records held at the State Library of Victoria were letters to parents written by its Secretary, S. Greig Smith, setting out the steps that they needed to take if their children were not to be removed from their care. A significant strand within this correspondence were letters ‘reminding’ deserting mothers that it was their ‘duty’ to return to their families. Yet, from matching these letters with the relevant case files, it was clear that many of the women had left because of their husband’s violence towards them, behaviour that was consistently denied or ignored by the Society’s inspectors. In a later project on the early years of the Family Court in Australia, violence again emerged as a central factor. While violence directed against the Court and its personnel dominated many of the interviews, the gendered violence which underwrote much of the Court’s business proved harder to unearth. Advocates for the introduction of no-fault divorce in Australia were motivated by a desire for a more civilised procedure to replace the ugly aspects of proving fault under the old system. ‘Cruelty’ constituted grounds for divorce under the existing legislation but it was difficult to prove and hence was used in only ten per cent of cases. Most applicants claimed either adultery or desertion, although solicitors practising at the time were aware that family violence was far more widespread than these statistics would indicate. 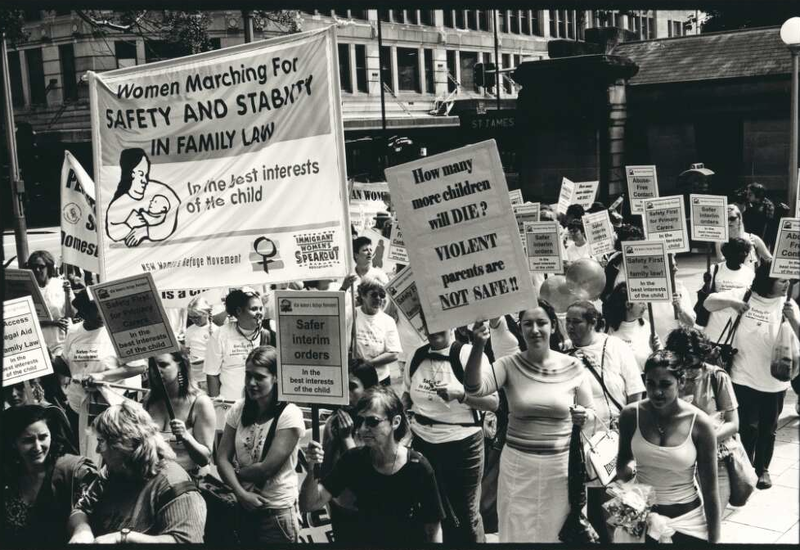 Women marching for safety and stability in Family Law at the International Women’s Day march in Sydney, 5 March, 2004. Image via Trove. The optimistic mood that accompanied the passage of the Family Law Act in 1975 temporarily lost sight of this uncomfortable reality. It recognised twelve months separation as the sole ground for divorce and assumed a 50:50 split of assets and shared custody of children as a starting point for negotiation. In an attempt to implement this new approach, Family Court personnel now recognise that they failed to see the violence that was present in so many relationship breakdowns, and the continuing impact it had on women’s lives following the separation. Some later noted that the justifications they used to deny the importance of such violence ironically mirrored those that were widely offered when the Court itself came under violent attack, i.e. that somehow the victim had brought it upon themselves. 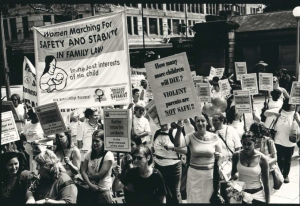 Born at a time when feminists were drawing attention to the prevalence of gendered violence and providing a vocabulary through which it could be discussed, the Court could not avoid the issue for long. It has struggled, and continues to struggle, to find ways to reconcile this reality with the concept of no-fault divorce. The extreme levels of security which now surround what were originally envisaged as ‘friendly’ courts is a daily reminder of the violence implicit in too many relationships. Yet reforms intended to recognise this as a factor in resolving disputes about the allocation of property and the future of children continue to be stymied by fathers’ rights groups and their political allies. And women and children continue to die as a result. As feminist historians we need to be alert to the need to translate this new awareness of the endemic nature of gendered violence back into our reading of sources generated at a time when the language for describing such violence was not available and its incidence was never acknowledged. Re-examined in this light, the ‘rebellious’ child fleeing from an institutional placement, or their family home, the ‘broken-down’ mother condemned for being unresponsive to her children’s needs, and indeed the black eyes behind the dark glasses worn periodically by too many women in my 1950s’ childhood, are all evidence of an endemic danger far too long denied. Women’s Legal Services Australia and Never Alone: Luke Batty Foundation have formulated a five-step plan for family law reform to help the courts better respond to domestic abuse cases. You can find out more and sign the petition here. 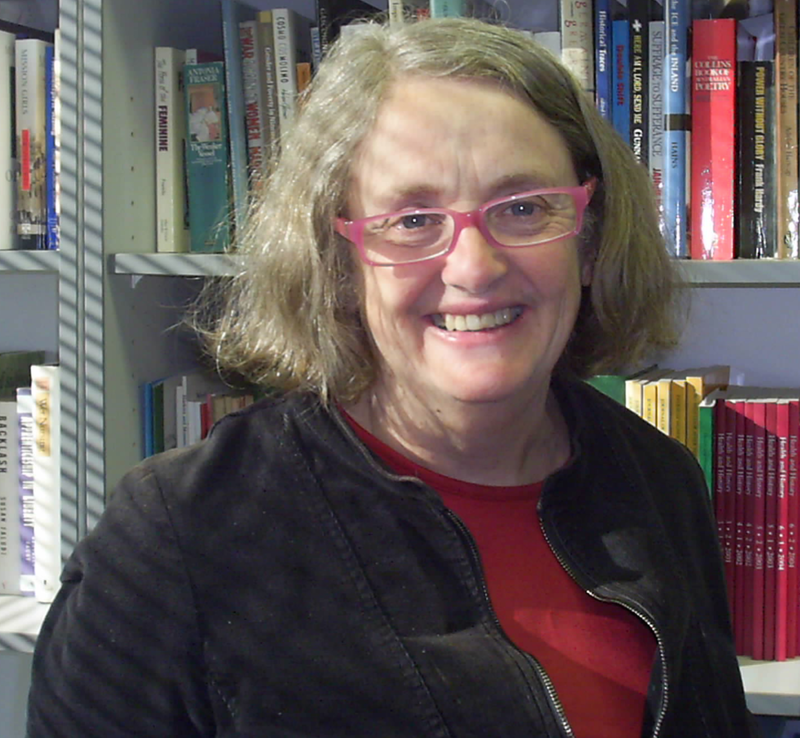 Shurlee Swain is the team leader of the Historicising Social Policy program within the Australian Catholic University’s Historical Research Concentration. 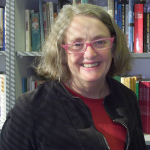 She has written extensively on Australia’s social history, women’s history, welfare history, history of the family, Indigenous history and history of childhood. With Marian Quartly and Denise Cuthbert she examined the history of forced adoptions in The Market in Babies: Stories of Australian Adoption and undertook a comparative study of child welfare practices with Margot Hillel in Child, Nation, Race and Empire: Child Rescue Discourse, England, Canada and Australia, 1850-1915. Shurlee is a Fellow of the Academy of Social Sciences in Australia.